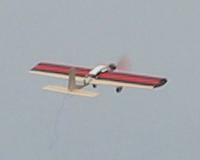 Since I figured out the Pico Stick, I've been searching for a good aerobatic trainer -- something smallish (mostly for aesthetic reasons -- I like small planes), medium speed (faster than the Pico Stick or Tiger Moth and fast enough to do aerobatics, but not a pylon racer), with full controls and predictable flying characteristics. The Formosa might have worked, but in its current state it's frightfully underpowered with the stock motor, and really doesn't fly well enough that I want to invest in a bigger motor. Besides, it's big and heavy. The Sporty was cool looking, but it can only fly fast -- try to slow it down and it tip-stalls and spins, too unpredictable for aerobatics. On a tip from Perry at Aeromicro, I took a chance on a Lil Hornet kit. (Actually, Perry recommended a Crazy Max, but Dave had a bad experience with the Mini Blue Max fuselage breaking -- other Crazy Max owners have had the same problem with that silly triangular flexy foam Wattage fuselage -- though since then we've found the perfect solution to the Max fuselage problem. What Perry said was that he had one he'd put some incredible number of flights on, and loved it.) It claims to be a cross between big aerobatic planes, and small slow park fliers. Sounds like just what I needed! Opening the box was a disappointment. I'm spoiled, I guess; I'm used to ARF planes that are mostly assembled already (though they always require more assembly than you expect, somehow). The Lil' Hornet was a pile of wing skins (needing to be glued together -- the Lil' Hornet's wings are skins around a balsa spar, so you get a very thick symmetrical wing with most of the center being air), some balsa pieces, a bag of motor parts, some photocopied instructions with no illustrations, and the blueprints (in lieu of illustrated instructions). Looking through the instructions, I was tempted to take it back. But I didn't have any other likely aerobat in the pipeline, and I'm tired of just the slow-fliers, so I dived in. I could see right off that I'd need to make changes. The fuselage is a stick of ... balsa! Everyone says that breaks right away, and you have to reinforce it ... no surprise! Instead, I bought a stick of hardwood the same size. The motor is a "Johnson motor" which everyone says is (a) underpowered and (b) amazingly short-lived. I was going to try it anyway, until I saw the instructions and discovered that you have to basically build your own gearbox by soldering and glueing a bunch of metal and wood rods and tubes. Sheesh, that's too much work for a motor that everybody says I'm going to replace right away anyway. So I decided on a GWS 350C (that's what Perry said he used until he upgraded to a brushless), one advantage being that we had several of them sitting around from other airplane projects, so it was no risk to try it out. Perry said the rudder was way too small and I should make a bigger one. I actually did cut a bigger rudder, but then at the last minute I didn't use it: Perry flies 3-D and I don't, and I had too much tail weight as it is (due to the hardwood spar) so I decided to try the original, and switch later. Finally, Perry said to reinforce the wings with tape -- the plane is fragile without that. Fragile is not a good thing for me, so I took that as gospel. Besides, the center wing spar looks fairly feeble (the plastic center section is really what holds the wings together) so I wanted to help that a bit. The building actually went pretty smoothly, despite my initial dismay. It took about three evenings. Setting up the jig for assembling the wing skins was tricky, but everything glued together fairly well (the tape didn't stick -- very little sticks to this foam -- but that didn't seem to matter). I'm a bit dubious about EZ-Hinges on the outside of balsa -- it was tricky to get those to stick, and I had CA on my fingers for days afterward (I didn't have any CA debonder; now I do). Besides, they're ugly. But once I finally got them to stick, they seem to work fine. The instructions seem to assume you're going to set it up with no rudder, even though it's billed as a fully aerobatic plane. The servos are all crowded together and it's not at all obvious where the rudder pushrod should go so its servo wheel doesn't collide with the one from the elevator, nor where to put the guide for elevator and rudder. I winged it, building a sort of fin that sticks up from the fuse halfway between the wing and tail. I used wood glue for building the wings, because I didn't have Elmers. I used CA glue almost exclusively for everything else (foam-safe CA for anything near the wings). It isn't as strong as epoxy or wood glue, and that turned out to be a good idea (see below, Crashing). I wasn't going to use their weird "glue together the two halves" wheels, but I glued the halves together just to see what they were like -- and suddenly I liked them, and kept them. The engine had to wait until last, because I had no idea where it would have to sit on the stick (which I left quite long in front) in order for the balance to work out right. Ironically, it ended up right at the end of the stick I had left, a couple of inches forward of where the original design put it -- good thing I didn't leave the stick any shorter! Then I had to shave down the top and bottom of the stick, and add some balsa on either side, to get the square profile needed to stick into a GWS 350 engine mount. The motor looks kinda strange sticking way out there ... oh, well! I used Zagi tape to reinforce the wings -- it's thin and light, and comes in nice decorative colors. Dave said to spray Super-77 on them first, since tape didn't stick well. I tried that on a scrap piece first. Good thing! It melted the foam, then stuck well to the stuff under what melted. I elected to just use the tape alone and hope it stuck well enough. It came in at 9.5oz without battery, just under 11 oz with a 1300mAh Li-po; quite a bit more than I'd hoped. Probably all that tape, not to mention the hardwood stick. But it's still a lot lighter than the Formosa, with the same engine. 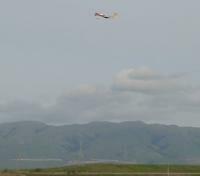 It was pretty windy at Baylands for the test flight. Oh, wait, it's always windy. Never mind. The way-too-brief instructions didn't say anything about recommended control throws, so I just guessed. I gave it about 2/3 throttle, figuring that it should be way overpowered, pointed it into the wind and tossed. 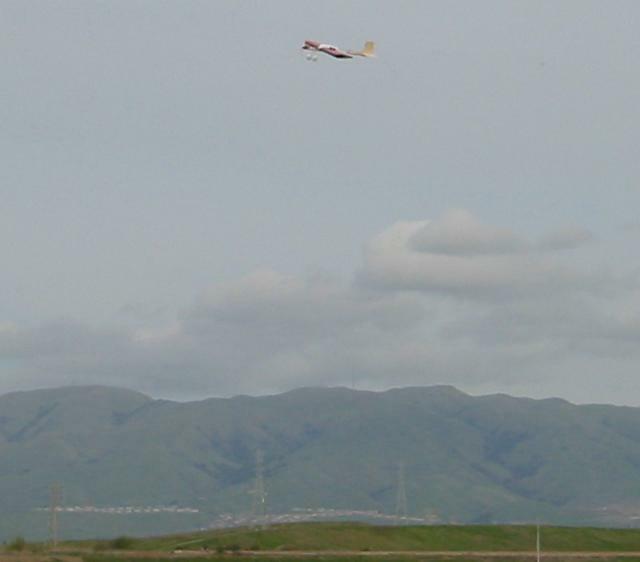 (Baylands has tall grass, so rolling takeoffs are difficult.) The plane just floated off, kinda like tossing a Zagi-type wings, leaving me plenty of time to get to the controls. The Lil' Hornet flew wonderfully! It flies slowly due to that thick wing, even with the big engine; but it doesn't have the susceptibility to gusts that the super-lightweight slow fliers like the Pico Stick have, and that engine gives it reasonable wind penetration (though later in the afternoon when the wind picked up, I had trouble making headway). I had what I thought might be too much aileron throw with those great big ailerons, but the roll rate was actually quite slow. I had no trouble making as sharp a turn as I wanted, but it doesn't have that instant-roll that the Sporty had. That made me nervous about trying an axial roll, but it turned out the symmetrical wing makes it easy to feed in a little down-elevator in the middle of the roll to stay on axis. (I still don't get it right most of the time, but I'll learn.) I bet it'll do lovely inverted flight, once I work up the nerve. Loops are easy -- none of the going-off-center that I saw in the Sporty or the Tiger Moth -- as are Immelmans and split-esses. It spins and snaps very gently, needing some effort to stall that big thick wing (moving the CG aft may change that). Cut the engine, and the plane floats slowly back to earth, with plenty of control. 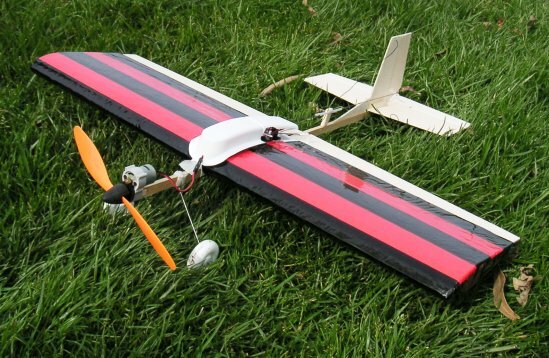 It does become more susceptible to wind gusts when flying slowly, but otherwise it glides just fine. Unfortunately, on the third day out while I was enjoying the Hornet's aerobatic capabilities, it was t-boned by a high-speed ducted fan fighter. :-( It was a spectacular crash, if you weren't one of the two pilots involved, with both planes exploding in midair and pieces flying everywhere. 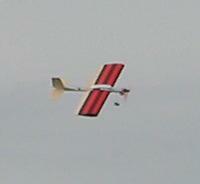 But Lil' Hornet II is flying now, and it flies just as well as the first one. Lil' Hornet II has crashed once too, mildly. The engine gearbox broke, the tail came off (intact, horizontal+vertical stabs came cleanly off the main spar) and a piece of aileron broke off. Repairs were easy (except for nobody having replacement gearboxes, apparently GWS is backordered). I highly recommend using only CA to glue the tail to the main spar, so the joint is a little weak and will separate cleanly.